In what circumstances would you choose hand welding? Sometimes referred to as manual welding, hand welding is an ideal technique for low or high product volumes where it is not cost-effective to use a larger welding machine, as well as intricate welding tasks in complex geometries where an alternative would be a robot cell welder. They are also commonly used for first or second or operation work when staking multiple points working in conjunction with a multi head machine. Tools are extremely important in hand welding with the correct designed tool ensuring the end welding result is both repeatable and strong. The operator controls the pressure being applied during the process whilst the generator will have a pre-defined timer set. On activation of the welder trigger the ultrasonic’s will start and the material will begin to soften and form, once the ultrasonic’s are complete the operator normally maintains pressure allowing for the weld to cool. The whole process is usually completed within about 3-5 seconds, actual time the ultrasonic’s are activated is normally under 1 second! The final outcome of the weld relies on a combination of well-designed tooling and precision equipment, which is why it is worth investing in both high quality hand welding machinery and market leading training to go with it. There are two main variants of hand welder, straight handle or pistol handle. Both have their own ergonomic advantages and is more often down to the customer on which is preferable for welding there product. We offer both hand welders in either 35 kHz or 40 kHz. 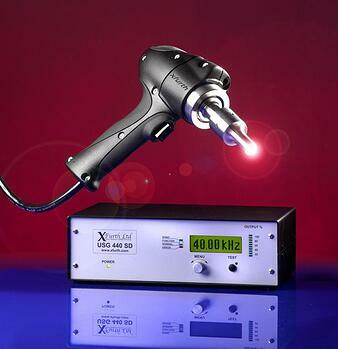 Ultrasonic hand welders have the ability to join two components together by riveting, overlapping the materials and welding through the top layer into the base layer. Or staking, this is when a peg or tab moulded into the base moulding passes through a hole in the top moulding and is formed giving a strong bond. Hand welding is not suitable for hermetic seals on mouldings or long continuous welds, for these requirements we have alternative equipment. Please get in touch with one of our team for a demonstration or advice on the best hand welder to choose for your business. An ultrasonic hand welder requires a far lower investment than a robot cell welder or multi head welding machine, this in itself is a big advantage in some circumstances. They are also able to add additional capacity to support existing machines saving time and money. Further savings are also made by the fact you do not have the requirement to use glue, fasteners or screws. Due to the quick cycle times achievable using a hand welder it can really save you considerable time in comparison to existing joining methods a full welding cycle including cooling is usually completed within 5 seconds. When staking and riveting plastics with a hand welder nearly all thermoplastic materials are compatible and dissimilar materials can also be joined. It is even possible to join plastic mouldings to metal components!! 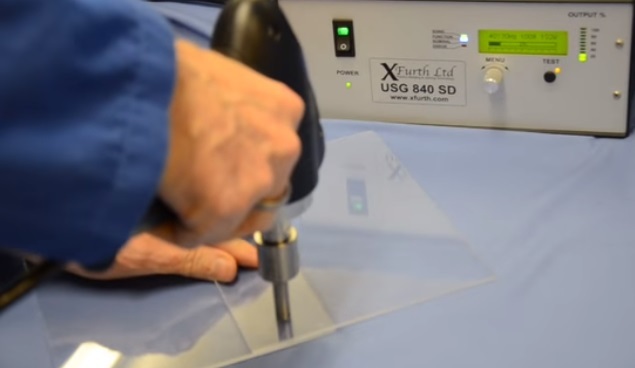 At Xfurth we specialise in manufacturing, maintaining and repairing a wide variety of thermoplastic welding machines. 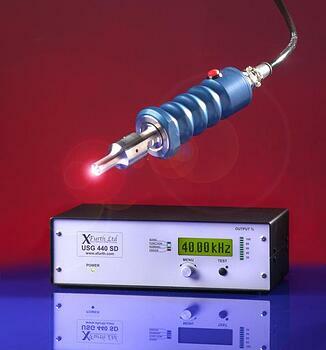 These include ultrasonic, spin, vibration, infrared, hotplate and laser welders. To find out more, please give our team a call, or send us a message through our online contact form.